Crocodiles rank among the ugliest of all animal species. While most people agree that all baby animals are cute – this one along with snakes are the exception. It is a type of reptile and one that is well known for being quite dangerous. In fact, large animals including hippos won’t mess with them in the water. The sizes of crocodiles varies significantly. It depends on the type of species as well as where they live. There are 23 known species of them found in the world. They live in various countries including the United States, India, Australia, Africa, Malaysia, and Pakistan. Many of them also have been relocated to crocodile farms. The largest one that has been found is about 20 feet long and weighs close to a ton. What they feed on can play a huge role in what their overall size will be. If are very interested in this animal, it is worth your time to explore the various species in detail. Then you will have a way to compare the differences among them as well as see the ways that they are similar to each other. You just never know what a crocodile is going to do. They can be slowly moving along or just observing the surroundings. Then – without warning – it will open its jaws and attack. They are often mistaken for alligators and even though they do fit into the same category of animals they are two different types of animals. What is really amazing is that crocodiles have been around since the beginning of time. It is believed that they were walking around on Earth during the time of dinosaurs as well. While most other types of animals have gone through remarkable changes due to evolution in order to survive they are virtually unchanged after all that time. It is estimated that they are more than 200 million years old. 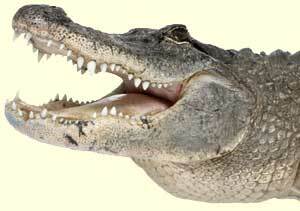 Even though crocodiles are almost always silent they can make some grunts and distress calls. In fact, they are believed to be the most vocal of all reptiles in the world. It is believed that they have more than 20 messages that they can send back and forth among their species to communicate. They live isolated lives and seem to do very well in any give environment. They are highly intelligent animals with excellent memories. They have been noted to return to areas that they were taken from years after that occurred. They have a great sense of direction. Crocodiles are very good hunters – waiting carefully for the right moment to give the element of surprise with their attack. The powerful jaws leave very little room for error. They also have extremely sharp teeth that they use to shred their prey with. They often start to tear it apart while it is still alive. The oldest one out there lives in Australia and is believed to be about 130 years old. For many humans there is no love lost when it comes to crocodiles. Most people don’t like the way they look. They are often portrayed as evil and as very vicious animals. Even so, there are some locations where they are well protected. Anyone caught hunting them can be fined, placed in jail, or both. There is still plenty that we don’t fully understand about crocodiles. This is part of what continues to make them so fascinating to researchers. They do have one of the most complex bodies of all animals. Yet it is one that continues to allow them to survive. Something they have been able to do for the past 200 million years.